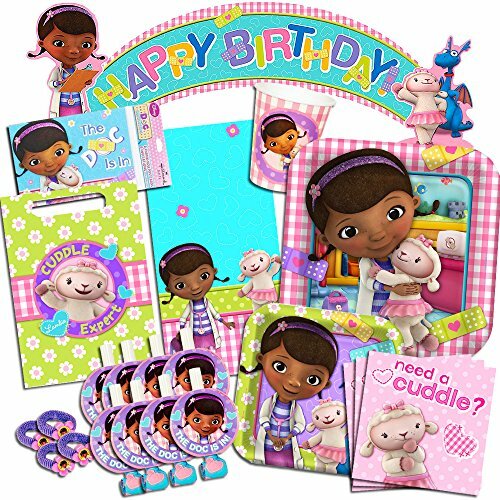 Disney Doc McStuffins Party Supplies Ultimate Set-- Birthday Party Favors, Plates, Cups, Napkins and More! Disney Junior Doc McStuffins Party Supplies Ultimate Set -- Plates, Cups, Napkins and More! Featuring Doc McStuffins and friends! This Doc McStuffins birthday party supplies set includes everything you need to throw the ultimate Doc McStuffins party. Doc McStuffins Party Supplies set includes: 8 Doc McStuffins cups, 8 Doc McStuffins dessert plates, 8 Doc McStuffins dinner plates, 16 Doc McStuffins napkins and 1 Doc McStuffins table cover. Also includes 8 Doc McStuffins Favor Bags, 8 Doc McStuffins Blowouts, 1 Doc McStuffins Birthday Banner, 8 Doc McStuffins Invitations and 8 Doc McStuffins Thank You Cards, and 4 Doc McStuffins Hair Bands. This Doc McStuffins party supplies set has everything you need for an unbeatable price! Perfect for any Doc McStuffins and Disney Junior fan. Disney Junior Doc McStuffins Party Supplies Ultimate Set -- Plates, Cups, Napkins and More! Featuring Doc McStuffins and friends! This Doc McStuffins birthday party supplies set includes everything you need to throw the ultimate Doc McStuffins party. Doc McStuffins Party Supplies set includes: 8 Doc McStuffins cups, 8 Doc McStuffins dessert plates, 8 Doc McStuffins dinner plates, 16 Doc McStuffins napkins and 1 Doc McStuffins table cover. Also includes 8 Doc McStuffins Favor Bags, 8 Doc McStuffins Blowouts, 1 Doc McStuffins Birthday Banner, 8 Doc McStuffins Invitations and 8 Doc McStuffins Thank You Cards, and 4 Doc McStuffins Hair Bands. This Doc McStuffins party supplies set has everything you need for an unbeatable price! Perfect for any Doc McStuffins and Disney Junior fan. If you have any questions about this product by Doc McStuffins Party Supplies, contact us by completing and submitting the form below. If you are looking for a specif part number, please include it with your message. Disney Cars Party Supplies Ultimate Set -- Plates, Dessert Plates, Cups, Napkins, Table Cover and Stickers!